The program will follow a basic 5-day per week, format. The Final (6th) week is an unload or “taper” week, with reduced volume to allow recovery before taking the DEA PTT. You’ll take the complete DEA PTT three times … at the beginning, in the middle, and at the end. Each time the program uses your most recent PTT scores for the follow-on progressions. In this way the program automatically “scales” the incoming, and improving fitness of each individual athlete. No matter your incoming fitness, this plan will push you. The training sessions are designed to around an hour. The first, 3rd and 5th Mondays of the plan you will perform 2-a-days (two sessions per day). In the morning you’ll take the DEA PTT, and in the evening, you’ll complete sets of push ups and sit ups and then 100m sprint repeats. During this program, every number of calisthenics repetitions you perform is based on the number of repetitions you completed at your most recent DEA PTT. Athlete performs 50x Push-ups on DEA PTT No.1 (Session 1). 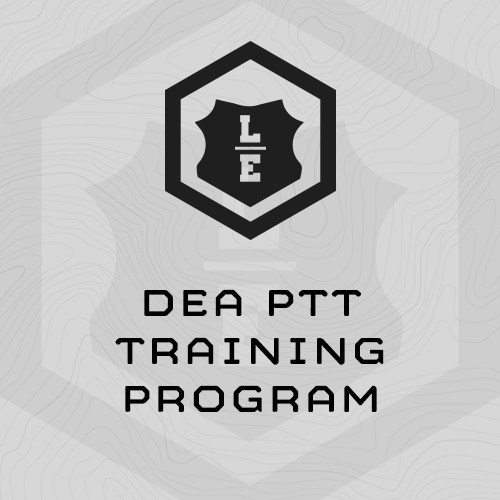 The DEA PTT tests your running ability with a relatively short 300m sprint, and a longer 1.5 mile run for time. You’ll run hard, fast 100m, 400m, or 800m repeats, four times/week. You’ll run an easy 2-4 miles once per week (Wednesday). Use the latest assessment results with the MTI Running Calculator to determine paces for subsequent training sessions. You’ll enter your most recent 1.5 mile assessment time to find the pace you must run for each distance in the plan. • Running area (track or other) with known 400m, 800m and 1 mile distances. Can I see a sample of the programming? Click the “Sample Training” tab above to see the entire Week 1 of programming. "A month ago I took DEA PTT and used my tried and true Army technique and just tried to gut through (I am a 280-290 guy so fairly confident). That test was a beast, and I failed miserably. After, I dropped out of 357 and into the MTI DEA Program in the month before my next text. (The plan is 6 weeks and I was only able to do 4, while on leave). The first test I got 6 total points with 43 S/U, 52 sec 300M, 34 P/U, 12:29 Run. A month later in 90+ degree heat 53 S/U, 45 sec 300m, 40 P/U, 10:59 Run with 19 points. Advice for other applicants: take the test seriously, have a game plan, and put in the work."